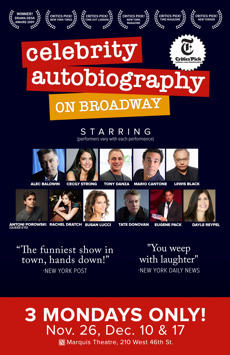 Celebrating its tenth year, Celebrity Autobiography is the Drama Desk Award-winning hit comedy show where celebrities act out “hot off the press” & hard-to-believe-they-wrote-‘em tell-alls. Featuring a first-rate comedic ensemble performing from the actual memoirs of a wide range of celebrities, this unique show will have you “weeping with laughter” NY Daily News. Playing to sold-out crowds all around the world including London's West End, Critics say: “ “The funniest show in town, hands down!" - New York Post, "Hilariously told! Big yuks entertainment" - New York Times, "Wickedly funny" - The Times of London, “Side splitting laughs” – Chicago Sun Times.